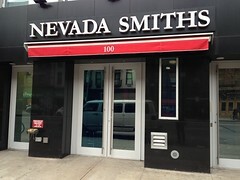 If you’ve peered into the new home of Nevada Smiths lately, you’ve likely seen soccer games playing on a television inside of the darkened space. And yet the doors are still locked, with no one in sight. After being exiled to Webster Hall in November of 2011, the soccer bar still hasn’t reopened at its new permanent home at 100 Third Avenue, but here’s some news: according to owner Patrick McCarthy, all systems are go for a reopening this weekend. At least, that’s the gooooooooooooooooooool. We’ll have more information after we kick it with Mr. McCarthy tomorrow. Update | 8:30 p.m. Mr. McCarthy now says it’s looking like early next week.